Pearse Redmond of Porkins Policy Review joins us for the first time to discuss how divide and rule has been used to neo-colonize the continent of Africa. We discuss how America and its allies have sown the seeds of strife, conflict and genocide in many different countries over the years, and the corporate and geopolitical interests that they are serving. We also discuss China’s role in Africa and whether it truly represents a third way. BERLIN: German Defense Minister Ursula von der Leyen is considering increasing the international engagement of German national defence forces, or Bundeswehr, local media Spiegel reported Sunday. “We cannot allow that the conflict sets the entire region in flames,” said Von der Leyen. The minister also said she was considering increasing the German contingent in Mali. “Currently, the mandate upper limit is 180 men with 99 soldiers on site. We could strengthen this commitment, which is also expected from our allies, especially the French government. I could imagine that the mandate will be increased up to 250 men,” said Von der Leyen. She replied “yes” when asked whether Germany should assume more international responsibility, suggesting the replacement of national armies in the European Union by united European forces in the long run. However, the minister admitted that there is still a long way to go before reaching the goals, and the requirement of parliamentary approval needs to be considered as well. “But I think unified armed forces will be a logical consequence of an ever-increasing military cooperation in Europe,” said Von der Leyen. President Hollande of France (like other leaders on NATO countries) does not seem to care about the French people! Abayomi Azikiwe (PAP),- France is continuing its occupation of northern Mali to the growing displeasure of youth who have staged a sit-in in the city of Gao. The young people, many of them women, believe that Paris is seeking to maintain its control over the region by pitting the Tuareg people against other nationalities inside the country. On May 30 the youth of Gao accused France of favoring the Tuareg rebel movement, the National Movement for the Liberation of Azawad (MNLA), over other groups by not consulting broadly in regard to plans related to the future of the state. National elections are scheduled to be held in July and talks have already been held in neighboring Burkina Faso between various political parties. The civilian government of President Amadou Toumani Toure was overthrown in a military coup on March 20, 2012. The engineer of the seizure of power was Capt. Amadou Sanogo who was trained in several military academies in the United States. Much attention was focused on the northern city of Kidal where France appears to be operating in alliance with the MNLA in the occupation. Reports indicate that the Malian army has not been able to enter the city through an agreement between France and the MNLA. Despite this widespread notion that France played a positive role in driving out several Islamist organizations from several northern cities, criticism against Paris has escalated in recent months. Attacks on the French occupation have taken place within the press and among some Malian politicians who are accusing the occupation forces of working to extend their presence inside the country. Gao was the first city that was attacked by the French military in January. Consequently, it is significant that the first mass demonstration was held there. Since the rebel campaign of the MNLA and other armed groups in the north of Mali, there have been hundreds of thousands of people who are internally displaced and forced into exile. Gao, which has a population of 70,000, has been severely impacted as well. In the aftermath of the military coup, and the seizure of power by the Movement for Oneness and Jihad in West Africa (MUJWA) and Ansar Dine in several northern cities and towns, France utilized this internal political crisis as a rationale for intervention. Nonetheless, the social situation of the civilian population has deteriorated with the French invasion. A recent United Nations report documents that there are serious issues that need addressing in Gao. For example, the access to clean drinking water is in serious decline. In addition to problems involving access to clean drinking water, food is also in short supply. The UN says that only one-third of the population of Gao is being serviced with food distribution. At present there are approximately 100 humanitarian organizations operating in Mali. According to the UN, the proposed budget of $410 million needed for humanitarian relief is only 29 percent funded. Most of the schools in the cities of Gao, Timbuctu and Kidal are still not functioning. The conditions in areas outside the cities and towns are even more precarious due to the lack of security despite the presence of nearly 4,000 French troops as well as thousands of soldiers from Chad and other regional states. With these problems continuing, it will be very difficult to organize credible national elections by the end of July. The UN reports that 174,000 Malians are living outside the country in neighboring states. The UN is attempting to ensure that refugees will have an opportunity to participate in the upcoming elections. ”While details of the out-of-country electoral process are still being worked out, UNHCR is ready to facilitate the exercise by refugees of their right to vote,” said UNHCR spokesperson Adrian Edwards. The bulk of Malian refugees are to be found in Mauritania with some 74,000 people being harbored. In Burkina Faso, it is reported that at least 50,000 have taken residence there and in Niger, another 50,000 have fled from the fighting and dislocation in northern Mali. Although France publicized its withdrawal of what it said was 2,000 troops from Mali during May, the occupation of the country will continue even into 2014. French defense ministry officials have said that at least 1,000 troops will remain after the conclusion of 2013 to serve as trainers for the Malian army and to work in conjunction with a UN peacekeeping force, numbering nearly 13,000 scheduled to take control of the country beginning on July 1. When members of the Movement for Oneness and Jihad in West Africa(MUJWA) and the Signatories in Blood staged a joint attack in two locations within neighboring Niger against the French-owned Areva uranium mining facilities and the local military on May 23, France took the lead in so-called counter-insurgency operations. Over two dozen Niger troops were killed in the attacks which the government claims was organized from southern Libya. Since the attacks on French interests in Niger, France has called for military operations in southern Libya to ostensibly prevent further attacks. The United States has also dispatched at least 100 Special Forces in Niger where it is establishing a drone station in the uranium-rich nation. nsnbc – In March 2013, nsnbc ínternational was started as a daily, independent, international on-line newspaper to provide high quality news, analysis and opinion from contributors throughout the world. nsnbc has a number of high profile contributors, and has a partnership with a number of other independent media, to guaranty you the best possible coverage. nsnbc is in a permanent mode of expansion to break, what we perceive as corporate and government controlled misinformation of peoples´world wide. Starting from a personal blog in 2011, it developed into a daily newspaper in 2013, and during 2014 – 16 we plan to have independent contributors in, and cover most countries. nsnbc is free to read and basic subscriptions are free of charge, but we appreciate donations. We also offer you to become an nsnbc insider by signing up for special, paid subscriptions, which offer you additional services, and access to an informed community. France’s intervention in northern Mali against Islamist extremists has disrupted the supply of cocaine to Europe, reported Middle East Online. In January, France sent in troops to combat al-Qaeda linked extremists who controlled the northern swathe of the country for nine months and were threatening to extend their reach southwards towards the capital Bamako. Extremist groups have long engaged in the lucrative drug running business as a means to secure funding. A common practice was to levy taxes upon smugglers running drugs sourced in Latin America, via Mali, to feed Europe’s growing market. The lack of any real government or police presence in the north of Mali facilitated the drug-trade. Typically, drugs are shipped to the Gulf of Guinea or flown directly in from Venezuela into Mauritania or Mali where they are stored and eventually transported to the Mediterranean’s southern shores. This route is commonly referred to as “Highway 10,” in reference to the line of latitude which cuts through Columbia, Venezuela, Guinea and Nigeria; the 10th parallel. The U.N.’s office on Drugs and Crime released a recent report that stated around 10 percent of the 172 tons of pure cocaine that found its way to Europe in 2010, transited through West Africa. France’s military intervention in Mali has “totally disrupted the trafficking of drugs, weapons and migrants in the region, smashing up all the networks transiting through northern Mali,” French researcher Mathieu Guidere was quoted by Middle East Online as saying. French special forces pressured some of the jihadist groups’ most remote bases, “this has sent everyone scurrying away but they are all trying to set up new routes,” Guidere said. Alain Rodier, head of France’s CF2R intelligence research center, said regional smuggling networks had already been disturbed by Arab Spring revolutions in Tunisia and Libya. “Traffickers however are continuing their business by using other routes, which demonstrates their ability to adapt,” he said. Smugglers have always adapted to new situations, said criminologist Xavier Raufer, who pointed out that the supply of cocaine from Latin America to Europe has never once broken in 40 years. “You can never draw accurate maps of cocaine trafficking because the routes have already changed by the time the ink dries up,” he explained. Sunday Times: Mr. President your recent offer of political dialogue was qualified with a firm rejection of the very groups you would have to pacify to stop the violence: the armed rebels and the Syrian National Coalition, the main opposition alliance. So in effect you are only extending an olive branch to the loyal opposition, mostly internal, that renounce the armed struggle, and who effectively recognizes the legitimacy of your leadership, who are you willing to talk to, really? If you want to talk about the opposition, there is another misconception in the West. They put all the entities even if they are not homogeneous in one basket – as if everything against the government is opposition. We have to be clear about this. We have opposition that are political entities and we have armed terrorists. We can engage in dialogue with the opposition but we cannot engage in dialogue with terrorists; we fight terrorism. Another phrase that is often mentioned is the ‘internal opposition inside Syria’ or ‘internal opposition as loyal to the government.’ Opposition groups should be loyal and patriotic to Syria – internal and external opposition is not about the geographic position; it is about their roots, resources and representation. Have these roots been planted in Syria and represent Syrian people and Syrian interests or the interests of foreign government? So, this is how we look at the dialogue, this is how we started and how we are going to continue. Firstly, detached from reality: Syria has been fighting adversaries and foes for two years; you cannot do that if you do not have public support. People will not support you if you are detached from their reality. A recent survey in the UK shows that a good proportion British people want “to keep out of Syria” and they do not believe that the British government should send military supplies to the rebels in Syria. In spite of this, the British government continues to push the EU to lift its arms embargo on Syria to start arming militants with heavy weapons. That is what I call detached from reality–when you are detached from your own public opinion! And they go further in saying that they want to send “military aid” that they describe as “non-lethal.” The intelligence, communication and financial assistance being provided is very lethal. The events of 11th of September were not committed by lethal aids. It was the application of non-lethal technology and training which caused the atrocities. The British government wants to send military aid to moderate groups in Syria, knowing all too well that such moderate groups do not exist in Syria; we all know that we are now fighting Al-Qaeda or Jabhat al-Nusra which is an offshoot of Al-Qaeda, and other groups of people indoctrinated with extreme ideologies. This is beyond hypocritical! What is beyond hypocrisy is when you talk about freedom of expression and ban Syrian TV channels from the European broadcasting satellites; when you shed tears for somebody killed in Syria by terrorist acts while preventing the Security Council from issuing a statement denouncing the suicide bombing that happened last week in Damascus, and you were here, where three hundred Syrians were either killed or injured, including women and children – all of them were civilians. Beyond hypocrisy when you preach about human rights and you go into Iraq, Afghanistan and Libya and kill hundreds of thousands in illegal wars. Beyond hypocrisy is when you talk about democracy and your closest allies are the worst autocratic regimes in the world that belong to the medieval centuries. This is hypocrisy! President Assad: When we say that we are fighting Al-Qaeda, we mean that the main terrorist group and the most dangerous is Al-Qaeda. I have stated in many interviews and speeches that this is not the only group in Syria. The spectrum ranges from petty criminals, drugs dealers, groups that are killing and kidnapping just for money to mercenaries and militants; these clearly do not have any political agenda or any ideological motivations. The so-called “Free Army” is not an entity as the West would like your readers to believe. It is hundreds of small groups – as defined by international bodies working with Annan and Al-Ibrahimi – there is no entity, there is no leadership, there is no hierarchy; it is a group of different gangs working for different reasons. The Free Syrian Army is just the headline, the umbrella that is used to legitimize these groups. President Assad: I would rather describe policies rather than describing people. So, it is still early to judge him. It is only a few weeks since he became Secretary of State. First of all, the point that you have mentioned is related to internal Syrian matters or Syrian issue. Any Syrian subject would not be raised with any foreigners. We only discuss it with Syrians within Syria. So, I am not going to discuss it with anyone who is coming from abroad. We have friends and we discuss our issues with friends, we listen to their advice but at the end it is our decision as Syrians to think or to make what’s good for our country. If anyone wants to ‘genuinely’ – I stress the word genuinely – help Syria and help the cessation of violence in our country, he can do only one thing; he can go to Turkey and sit with Erdogan and tell to him stop smuggling terrorists into Syria, stop sending armaments, stop providing logistical support to those terrorists. He can go to Saudi Arabia and Qatar and tell them stop financing the terrorists in Syria. This is the only thing anyone can do dealing with the external part of our problem, but no one from outside Syria can deal with the internal part of this problem. President Assad: There is no contact between Syria and Britain for a long time. If we want to talk about the role, you cannot separate the role from the credibility. And we cannot separate the credibility from the history of that country. To be frank, now I am talking to a British journalist and a British audience, to be frank, Britain has played a famously (in our region) an unconstructive role in different issues for decades, some say for centuries. I am telling you now the perception in our region. The problem with this government is that their shallow and immature rhetoric only highlight this tradition of bullying and hegemony. I am being frank. How can we expect to ask Britain to play a role while it is determined to militarize the problem? How can you ask them to play a role in making the situation better and more stable, how can we expect them to make the violence less while they want to send military supplies to the terrorists and don’t try to ease the dialogue between the Syrians. This is not logical. I think that they are working against us and working against the interest of the UK itself. This government is acting in a naïve, confused and unrealistic manner. If they want to play a role, they have to change this; they have to act in a more reasonable and responsible way, till then we do not expect from an arsonist to be a firefighter! President Assad: Actually, I did not change my mind. Again, this plan is not for them; it is for every Syrian who accepts the dialogue. So, making this initiative is not a change of mind. Secondly, since day one in this crisis nearly two years ago, we have said we are ready for dialogue; nothing has changed. We have a very consistent position towards the dialogue. Some may understand that I changed my mind because I did not recognize the first entity, but then I recognized the second. I recognized neither, more importantly the Syrian people do not recognize them or take them seriously. When you have a product that fails in the market, they withdraw the product, change the name, change the packing and they rerelease it again – but it is still faulty. The first and second bodies are the same products with different packaging. Regarding what our minister said, it is very clear. Part of the initiative is that we are ready to negotiate with anyone including militants who surrender their arms. We are not going to deal with terrorists who are determined to carry weapons, to terrorize people, to kill civilians, to attack public places or private enterprises and destroy the country. Sunday Times: Mr. President, the world looks at Syria and sees a country being destroyed, with at least 70,000 killed, more than 3 million displaced and sectarian divisions being deepened. Many people around the world blame you. What do you say to them? Are you to blame for what’s happened in the country you are leading? Looking at the issue of political agendas, we have to ask better questions. How were these numbers verified? How many represent foreign fighters? How many were combatants aged between 20 and 30? How many were civilians – innocent women and children? The situation on the ground makes it almost impossible to get accurate answers to these important questions. We all know how death tolls and human casualties have been manipulated in the past to pave the way for humanitarian intervention. The Libyan government recently announced that the death toll before the invasion of Libya was exaggerated; they said five thousand victims from each side while the number was talking at that time of tens of thousands. The British and the Americans who were physically inside Iraq during the war were unable to provide precise numbers about the victims that have been killed from their invasion. Suddenly, the same sources have very precise numbers about what is happening in Syria! This is ironic; I will tell you very simply that these numbers do not exist in reality; it is part of their virtual reality that they want to create to push forward their agenda for military intervention under the title of humanitarian intervention. President Assad: It is a mix, but it seems that you are implying that one person is responsible for the current situation and all the human casualties. From day one the situation in Syria has been influenced by military and political dynamics, which are both very fast moving. In such situations you have catalysts and barriers. To assume any one party is responsible for all barriers and another party responsible for all the catalysts is absurd. Too many innocent civilians have died, too many Syrians are suffering. As I have already said nobody is more pained by this than us Syrians, which is why we are pushing for a national dialogue. I’m not in the blame business, but if you are talking of responsibility, then clearly I have a constitutional responsibility to keep Syria and her people safe from terrorists and radical groups. President Assad: The role of Al-Qaeda in Syria is like the role of Al-Qaeda anywhere else in this world; killing, beheading, torturing and preventing children from going to school because as you know Al-Qaeda’s ideologies flourish where there is ignorance. Ideologically, they try to infiltrate the society with their dark, extremist ideologies and they are succeeding. If you want to worry about anything in Syria, it is not the ‘minorities.’ This is a very shallow description because Syria is a melting pot of religions, sects, ethnicities and ideologies that collectively make up a homogeneous mixture, irrelevant of the portions or percentages. We should be worrying about the majority of moderate Syrians who, if we do not fight this extremism, could become the minority – at which point Syria will cease to exist. President Assad: Threatening by ideology more than the killing. The killing is dangerous, of course, but what is irreversible is the ideology; that is dangerous and we have been warning of this for many years even before the conflict; we have been dealing with these ideologies since the late seventies. We were the first in the region to deal with such terrorists who have been assuming the mantle of Islam. We have consistently been warning of this, especially in the last decade during the invasion and occupation of Afghanistan and Iraq. The West is only reacting to the situation, not acting. We need to act by dealing with the ideology first. A war on terror without dealing with the ideology will lead you nowhere and will only make things worse. So, it is threatening and it is dangerous, not just to Syria but to the whole region. President Assad: You know the crime is not only about the victim and the criminal, but also the accomplice providing support, whether it is moral or logistical support. I have said many times that Syria lies at the fault line geographically, politically, socially and ideologically. So, playing with this fault line will have serious repercussions all over the Middle East. Is the situation better in Libya today? In Mali? In Tunisia? In Egypt? Any intervention will not make things better; it will only make them worse. Europe and the United States and others are going to pay the price sooner or later with the instability in this region; they do not foresee it. Sunday Times: I have his name…I will bring it to you later. President Assad: As I said every victim in this crisis has a name, every casualty has a family. Like 5 year-old Saber who whilst having breakfast with his family at home lost his leg, his mother and other members of his family. Like 4 year-old Rayan who watched his two brothers slaughtered for taking him to a rally. None of these families have any political affiliations. Children are the most fragile link in any society and unfortunately they often pay the heaviest price in any conflict. As a father of young children, I know the meaning of having a child harmed by something very simple; so what if they are harmed badly or if we lose a child, it is the worst thing any family can face. Whenever you have conflicts, you have these painful stories that affect any society. This is the most important and the strongest incentive for us to fight terrorism. Genuine humanitarians who feel the pain that we feel about our children and our losses should encourage their governments to prevent smuggling armaments and terrorists and to prevent the terrorists from acquiring any military supplies from any country. President Assad: Everything that has been referred to in the media or by official rhetoric regarding Syrian chemical weapons is speculation. We have never, and will never, discuss our armaments with anyone. What the world should worry about is chemical materials reaching the hands of terrorists. Video material has already been broadcast showing toxic material being tried on animals with threats to the Syrian people that they will die in the same way. We have shared this material with other countries. This is what the world should be focusing on rather than wasting efforts to create elusive headlines on Syrian chemical weapons to justify any intervention in Syria. President Assad: This is constructive ambiguity. No country will talk about their capabilities. Sunday Times: A lot has been talked about this as well: what are the roles of Hezbollah, Iran and Russia in the war on the ground? Are you aware of Hezbollah fighters in Syria and what are they doing? What weapons are your allies Iran and Russia supplying? What other support are they providing? President Assad: The Russian position is very clear regarding armaments – they supply Syria with defensive armaments in line with international law. Hezbollah, Iran and Russia support Syria in her fight against terrorism. Russia has been very constructive, Iran has been very supportive and Hezbollah’s role is to defend Lebanon not Syria. We are a country of 23 million people with a strong National Army and Police Force. We are in no need of foreign fighters to defend our country. What we should be asking is, what about the role of other countries, – Qatar, Turkey, Saudi Arabia, France, the UK, the US, – that support terrorism in Syria directly or indirectly, militarily or politically. President Assad: Do not expect a politician to only say yes or no in the absolute meaning; it is not multiple choice questions to check the correct answer. You can expect from any politician a vision and our vision is very clear. We have a plan and whoever wants to deal with us, can deal with us through our plan. This is very clear in order not to waste time. This question reflects what has been circulating in the Western media about personalizing the problem in Syria and suggesting that the entire conflict is about the president and his future. If this argument is correct, then my departure will stop the fighting. Clearly this is absurd and recent precedents in Libya, Yemen and Egypt bear witness to this. Their motive is to try to evade the crux of the issue, which is dialogue, reform and combating terrorism. The legacy of their interventions in our region have been chaos, destruction and disaster. So, how can they justify any future intervention? They cannot. So, they focus on blaming the president and pushing for his departure; questioning his credibility; is he living in a bubble or not? is he detached from reality or not? So, the focus of the conflict becomes about the president. President Assad: Whenever an issue that is related to the UN is raised, you are raising the question of credibility. We all know especially after the collapse of the Soviet Union – for the last twenty years – that the UN and all its organizations are the victims of hegemony instead of being the bastions of justice. They became politicized tools in order to create instability and to attack sovereign countries, which is against the UN’s charter. So, the question that we have to raise now is: are they going to take the American and the British leaders who attacked Iraq in 2003 and claimed more than half a million lives in Iraq, let alone orphans, handicapped and deformed people? Are they going to take the American, British French and others who went to Libya without a UN resolution last year and claimed again hundreds of lives? They are not going to do it. The answer is very clear. You know that sending mercenaries to any country is a war crime according Nuremberg principles and according to the London Charter of 1945. Are they going to put Erdogan in front of this court because he sent mercenaries? Are they going to do the same with the Saudis and the Qataris? If we have answers to these questions, then we can talk about peace organizations and about credibility. 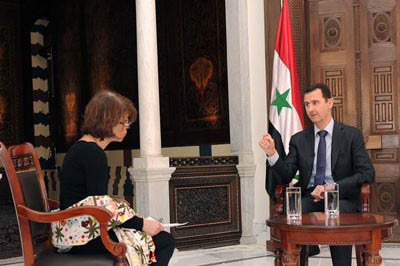 President Assad: Of course, I heard about the story through the media. When a journalist goes into conflict zones, as you are doing now, to cover a story and convey it to the world, I think this is very courageous work. Every decent person, official or government should support journalists in these efforts because that will help shed light on events on the ground and expose propaganda where it exists. Unfortunately in most conflicts a journalist has paid the ultimate price. It is always sad when a journalist is killed because they are not with either side or even part of the problem, they only want to cover the story. There is a media war on Syria preventing the truth from being told to the outside world. 14 Syrian journalists who have also been killed since the beginning of the crisis and not all of them on the ground. Some have been targeted at home after hours, kidnapped, tortured and then murdered. Others are still missing. More than one Syrian television station has been attacked by terrorists and their bombs. There is currently a ban on the broadcast of Syrian TV channels on European satellite systems. It is also well known how rebels have used journalists for their own interests. There was the case of the British journalist who managed to escape. President Assad: Yes. He was lead into a death trap by the terrorists in order to accuse the Syrian Army of his death. That’s why it is important to enter countries legally, to have a visa. This was not the case for Marie Colvin. We don’t know why and it’s not clear. If you enter illegally, you cannot expect the state to be responsible. Contrary to popular belief, since the beginning of the crisis, hundreds of journalists from all over the world, including you, have gained visas to enter Syria and have been reporting freely from inside Syria with no interferences in their work and no barriers to fulfill their missions. Pressfortruth.ca correspondent Tyrone Drummond takes a closer look at the ongoing situation in Mali with sociologist, former Canadian Soldier, and author of the book: Globalization of Nato, Madhi Darius Nazemroaya. Youtube description: I had the opportunity to voice my opposition about Canada’s Role in the War in Mali to Canadian Prime Minister Stephen Harper after he hosted French Prime Minister Jean Marc Ayrault for dinner at the Chateau Laurier in Ottawa on March 13th,2013.